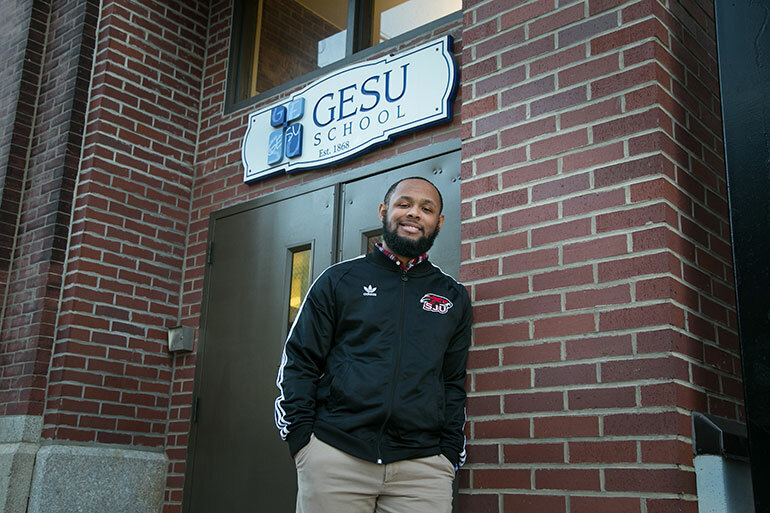 Eric Jackman ’15 helps students view themselves as part of a larger community as service program coordinator at the Gesu School, where he attended kindergarten through fifth grade. Without the influence of his lifelong Jesuit education, Eric Jackman ’15 isn’t sure where he’d be today. A graduate of Gesu School and Saint Joseph’s Prep, Jackman earned a psychology degree from Saint Joseph’s in May and returned to Gesu as the service program coordinator. Jackman credits the University’s Ignatian College Connection (ICC) with helping him complete Philadelphia’s Jesuit education trifecta. Reaching out to Philadelphia’s diverse cultural, educational and socioeconomic students, the ICC emulates the mission of St. Ignatius of Loyola and the first Jesuits who provided educational resources to anyone with a desire to learn. Rev. George Bur, S.J., then-rector of the University’s Jesuit Community, launched the program in 2004. The Jesuit Community at Saint Joseph’s University initially funded the program. Since then, many alumni, friends, corporations and foundations have supported the program. Upon being accepted to SJU, ICC high school program participants are encouraged to compete for the ICC Scholarship, which provides eight semesters of tuition. Scholarship awardees are expected to excel in the classroom and encouraged to assume leadership positions within the SJU community. Scholars participate in recruiting, mentoring and programming with high school populations. For some, like Eric, this extends to teaching during summer programming. Since the ICC’s founding, 41 ICC Scholars have earned SJU degrees. More than four of every five ICC Scholars graduate within four years. The University welcomed four members for this year’s 12th cohort, bringing the ICC Scholars enrolled at SJU this academic year to 20. Jackman’s return to Gesu as a member of the fifth cohort of the Alliance for Catholic Education (ACE-SJU) is a testament to his desire to help students from backgrounds similar to his own, according to Dessus. ACE-SJU is a two-year service program matching recent graduates with teaching or administrative roles in under-resourced Catholic schools in the Philadelphia region while pursuing a master’s degree at SJU. Sounds like Jackman’s Jesuit education has given him a great start. Launched in 2006 as a partnership between Saint Joseph’s University and Gerry and Marguerite Lenfest, the Lenfest Scholars Program is a unique, incentive-based program for students enrolled at Philadelphia’s Gesu School who matriculate at Saint Joseph’s. Each year, up to eight high-achieving Gesu seventh graders are invited to participate in the six-year program, through which they receive tuition credits toward a Saint Joseph’s education as an incentive for their continued academic excellence and college preparation. During those six years, students engage in college awareness and enrichment programs through SJU’s Ignatian College Connection. The inaugural cohort of Lenfest Scholars are juniors at Saint Joseph’s. Two juniors, two sophomores and a freshman attend SJU as Lenfest Scholars and are eligible for additional scholarship support through the James W. and Eileen R. Lannon Scholarship, named in memory of the parents of Saint Joseph’s 26th president, Timothy R. Lannon, S.J. Complementary to the Ignatian College Connection, the Lenfest Scholars Program has enabled students from under-resourced areas to imagine a future that includes a college degree, truly allowing these students to live greater.